Two new items are now available for the winter season from Masquerade and Crown Jewels shops! Add a fresh Snowman Head for your avatar from the Masquerade shop or get in to the New Year fun with a fresh 2017 Exit Effect from Crown Jewels. Both available now, but not for long! 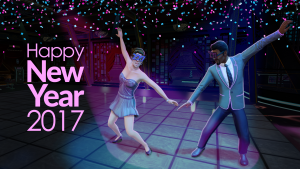 Also, don’t forget to log into The Four Kings on January 1st to receive a free pair of 2017 Party Glasses!